With the popularity of P.T. Barnum's circus and America's game-baseball-peanuts became the snack food of the people across the country in the late 1800s. Sold hot from a roaster to the cries of "Peanuts, get your hot peanuts here," this popular snack soon became a valuable cash crop. The farmland around Suffolk, Virginia was perfect for growing goobers, and the town was soon known as the "World's Greatest Peanut Market." Suffolk's peanut star was already on the rise when an Italian immigrant named Amedeo Obici moved his chocolate and nut operation, Planters Peanuts, to town in 1913 to be in the heart of peanut country. Three years later, Mr. Peanut was born in Suffolk. The success of the goober gave the community cause to celebrate, and it did so on the first large-scale basis in 1941 with the National Peanut Festival and Exposition, complete with a parade and queen. Today the Suffolk Peanut Fest carries on the legume's legacy. More than 200,000 people attend the fete each fall to enjoy family entertainment and pay homage to the humble peanut. 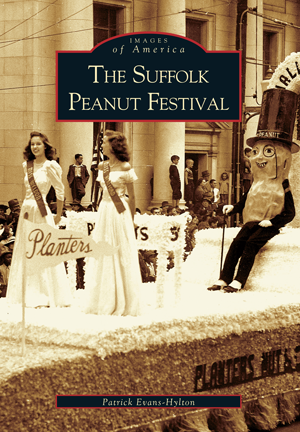 In Images of America: The Suffolk Peanut Festival, author Patrick Evans-Hylton has collected over 200 archival images that capture the essence of this beloved celebration. Patrick, a local Tidewater resident, is an editor for Hampton Roads Magazine and an avid history enthusiast.